In New Zealand in 2010, an earthquake 7.1 on the Richter scale shook open the earth in a previously unknown fault. Over the next three years, some 14,000 aftershocks hit the residents of the Canterbury region. One particularly devastating quake in February 2011 killed 185 people and damaged much of the city of Christchurch. In fact, up until July 2013, the center of Christchurch was totally cordoned off. Clean up and reconstruction has been intensive and ongoing. One sad statistic: only 20 percent of the city’s original buildings will remain when demolition is complete, writes the Christchurch city government. 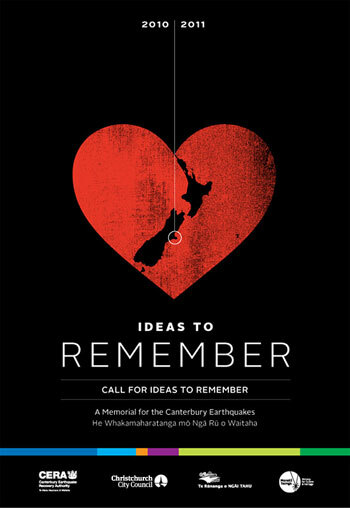 The memorial will be on a stretch of Ōtākaro/Avon River, between the Montreal Street bridge and Rhododendron Island. The Christchurch government says the site was chosen because it offers a “quiet, contemplative space” that can conversely also host large events for crowds up to 2,000. A tree-lined route, which includes a “bridge of remembrance,” will connect the memorial to the inner city. The design competition is open to everyone, all over the world. The entries will be judged anonymously, with only an ID number accepted on the submission form. This is mean to eliminate any possible “professional or personal bias” among the judges. Entries are due August 22. PAP seeks concepts that “possess the rigor and excitement” found throughout the history of the series. Landscape architects: Register by August 1 and submit your best ideas by September 1. Winners will receive $2,500 to flesh out their proposals.